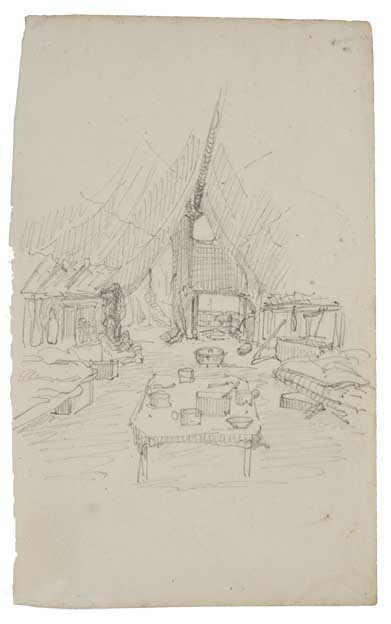 Henry Winkles, Sailors, Prince Regent & Canadian Gullies, 1850s, pencil on paper. Courtesy Art Gallery of Ballarat, purchased Purchased with funds from the Colin Hicks Caldwell Bequest, 2004. Amy (Williams) was born 29 March 1833 at Monmouth, Wales. She married John Cail in New Zealand in 1851. In 1853 John Cail returned to New Zealand for his wife Amy.. On 25 August 1853 John and Amy arrived in Melbourne from Wellington, New Zealand on the Arion bringing with them their first child, 11 month old Agnes Amy. They proceeded to the Ballarat goldfields in September of that year. John prospected for gold and Amy set up a grocery store in a large tent as food was scarce on the goldfields". John and Amy were among the early arrivals on the goldfields at Ballarat at the start of the "rush", setting off from Melbourne to seek their fortune with their few possessions in a covered wagon. Many of the miners were unable to pay for their gold digging licences. Great unrest broke out leading to to a revolt which was led by Peter Lalor. After the attack on the Eureka Stockade on 03 December 1854 he became a hunted man. According to family history Amy Cail helped hide ... Peter Lalor after the attack on the Eureka Stockade." She (Amy) was the wife of miner John Cail, and according to family tradition helped Peter Lalor after he avoided capture on 3rd December 1854. Cail Amy - Helped to hide Peter Lalor (Monmouth, Wales). After the rebellion in which the miners fared badly Peter Lalor became a hunted man. However he had many friends who found in him a 'champion' and one of these was Amy Cail who hid him in her large tent by cutting the ropes in pretence of leaving the goldfields. Because of this Lalor was able to make his escape. He later became a Member of Parliament. The couples second child George Henry, named for John Cail's father, was born in 1854. He would have been born on the Ballarat goldfields as the family was present at the Eureka Stockade which took place in December 1854. John Cail continued to mine on the Ballarat Goldfields after the Eureka Stockade riot in 1854. It is likely that John and Amy and their family continued to live on the goldfields and that Amy continued to run her grocery store there until 1856 . John was mining in Canadian Gully and continued to hold Miner's Rights until 1866 so was still mining until the year before the family moved to Mt. Rowan. Amy Cail, widowed in 1905, was still living in Kamarooka in 1909 as she was listed there in the 1909 Australian Electoral Roll as home duties. Also living in Kamarooka were her son George Henry Cail farmer and his son John Speedy Cail labourer, and her son Walter Benjamin Cail farmer and his wife Henrietta Cail home duties. Amy died at the home of her daughter, Alice Maud Henderson in Sydney Road Brunswick. Amy died on 15th July 1914 aged 81 years. She was recorded as occupation: domestic duties. The informant on her Death Certificate was her son in law Angus McGregor Henderson, 173 Sydney Road, Brunswick. Amy lived for 60 years in Victoria. The Minister at the funeral was Rev. Edwin J. Torrance Church of England. She is buried in the Raywood Cemetery with her husband John Cail. Peter Lalor. 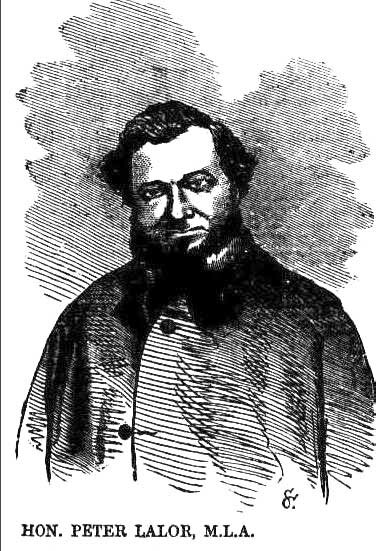 Melbourne Leader, 17 May 1862. After Eureka Amy and John Cail lived at Mount Rowan, where they grew vegetables to sell to miners and people in Ballarat. They sold this land in 1876, after having moved to Kamarooka near Bendigo in 1873. She is buried at Raywood Cemetery. Ballarat 25th of August 1860 I John Cail do hereby give notice that on 25th day of August at the hour of 10 o'clock a.m. I did take possession of a residence claim, being 38 feet by 96 feet , situated West side of Plank Rd near Boomerang Hotel and any person or persons having any objection to my being registered for said residence claim, shall send a notice of such objection to the Mining Registrar of this division, on or before the 3rd day of August 1860 for John Cail Hugh McKenzie." A handwritten note states: "Subject to right of way." Address: as above.. In the 1865 - 1966 Directory of Ballaarat John Cail is listed as a storekeeper in Bridge Street, Ballarat. John Cail's store is also listed in the Ballarat and Ballarat East directory including Clunes, Creswick, Smythesdale and Scarsdale for 1865 66, compiled by F.M. Dicker. John is listed as storekeeper, Bridge Street. It seems unlikely that Amy would have worked in any of these stores, as by 1856 when they owned the Gipps Street Store, the couple had three children. By the time they owned the store in Bridge Street Amy had given birth to eight children. Their fourth child Aaron Benjamin who was born in 1858 died as an infant. By February 1867 John Cail had bought land in Mt. 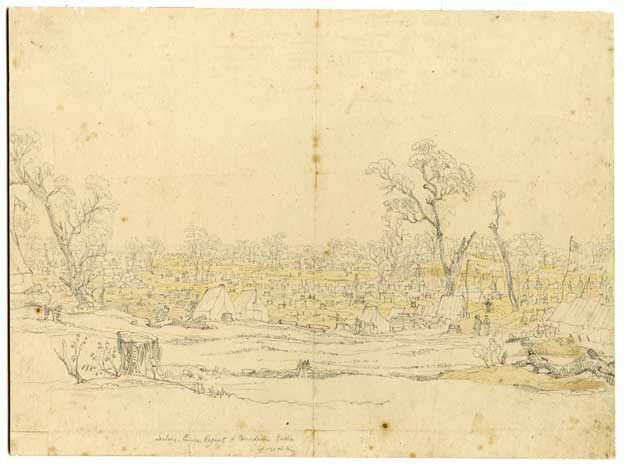 Rowan, near Ballarat, occupying two blocks of land (22 acres), on the corner of Colliers Road and Forest Road to grow vegetables. As food was still in short supply in the Ballarat area he and his family grew produce which found a ready market. The older children would have been of an age to help their father with the work on the farm. Amy's time would have been entirely taken up with domestic duties as by 1876, when they sold the land, the couple had eleven surviving children, the last of them born in the year they left Mt. Rowan. John sold the land in Mt. Rowan in 1876 because the family had selected land and moved to Kamarooka three years previously. John was one of the first to select in Kamarooka and he and his family moved there in August 1873 where they took up a lease on 384 acres of land. Records show many drought years in the 1880s which made it hard for selectors to pay their rents. A Funeral Notice for Amy in the Argus dated 16 July 1914 respectfully notified friends "that her remains will be interred in the Raywood Cemetery, on arrival of the train from Melbourne at Raywood, about 1 p.m. on Friday July 27th." ↑ Public Records Office Victoria: prov.vic gov.au - Wills and Testaments; Unassisted Passenger lists to Victoria. ↑ Corfield, J.,Wickham, D., & Gervasoni, C. The Eureka Encyclopaedia, Ballarat Heritage Services, 2004. ↑ Williams, Arthur, Cails of Kamarooka document for the 102nd anniversary of the Cail family selecting land in Kamarooka, Reunion 09 March 1975. ↑ Dorothy Wickham, Women of the Diggings: Ballarat 1854, Ballarat Heritage Services, 2009. ↑ Hocking, Geoff, The Eureka Stockade: A Pictorial History, Five Mile Press 2004. ↑ Gold Museum Ballarat: archive collection re John Cail (70.5512.19), accessed by Kay Clarke. ↑ Will of Mr. John Cail, 23rd October 1904, accessed by Kay Clarke. ↑ Australian Electoral Roll 1909. ↑ Death Notice: Argus, 16 July 1914. ↑ Victorian Death Certificate for Amy Cail. ↑ Death Certificate and Tombstone Photo at Raywood Cemetery. ↑ Ballarat Courier, 09 July 1864. This page was last edited on 7 August 2017, at 23:15.